Blown Away with how great this holster is!!!! I have two friends that have holsters from JM4 Tatical. I have never been a fan of leather holsters. most are so bulky and have to be belt mounted. When I first got this holster, I put my CANIK TP9 SF Elite into it. Put the holster on my gym shorts and without breaking the holster in, I was able to pull the gun out and not bring the holster with it. I am completely sold on this product. After I worked the leather some I was able to clip it to the plastic door compartment of my vehicle and could draw the gun without the holster. This is a huge plus due to the fact that I will not be able to fasten a steering column holster to my wife's vehicle. Over all it's a nice holster. The stitching is solid, the leather is excellent quality. I was expecting a super strong magnet based off of the videos and reviews. It slides a bit when I wear non-cotton yoga pants, but that doesn't surprise me it is slick material. It doesn't dig into my ribs like my hybrid holster does, and it doesn't make me sweat profusely. I am very pleased with the quality and customer service. Great holster, and the leather is really quality material. There is always room for improvement though, with that said if you just want to carry this holster in the 4 o'clock position then its perfect but it sits too low for the appendix position. My last critique is the magnet sticks out just a touch to far so when your carrying it can stick out from time to time. Other than that the holster is awesome and I love it. I have probably 25 holsters from name brands and this by far is the most comfortable,durable and quality leather holster I have ever purchased.!! I highly recommend this product. Shipping was fast and the holster met all my expectations. Still breaking it in, but you can tell this will last for years.Quality is 5 stars plus. Thx JM4! Really great quality, nice holster! I'm happy with the feeling and bright appearance of the original holster in teal. Workmanship is meticulous. The color, though not suggestive of an high-plains-drifter masculinity, does what this male owners old eye want it to do. I can spot it in a sea of black or neutral colors when I fail to put it where my lying memory tells me I put it. The holster fits a PPQ M2 22LR well. Although I don't live with enough fear to feel I have to conceal carry, this holster would do that well if I wish to get to and from the range without making it plain to one and all that I've a weapon on me. Nicely done to the team at JM4. I don’t write many reviews but this one I had to and recommend this holster. I have had problems finding an IWB holster that was comfortable to wear. In turn I’ve been carrying smaller guns with less capacity. After receiving this holster I used it for my CZ P01 and discovered it’s by far the most comfortable holster I own. 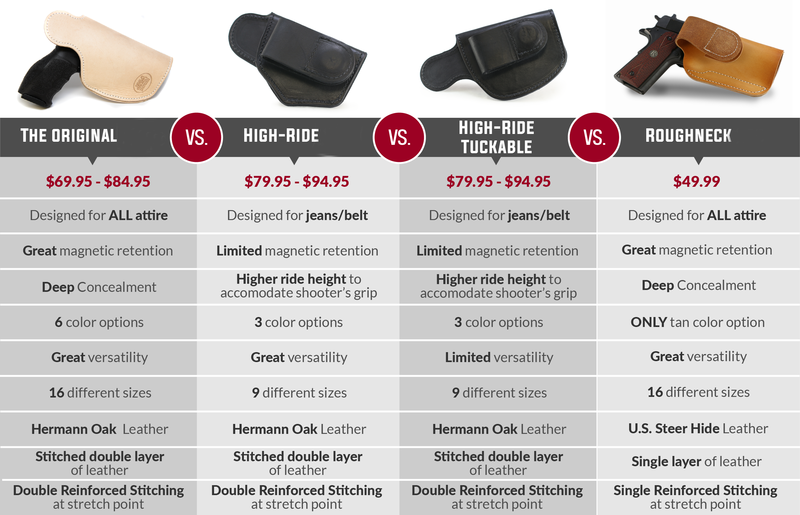 The retention is great and it’s very easy to adjust the position of the holster. On another note I got call from JM4 Tactical the day after I placed the order to let me know that it wasn’t going to ship until the end of the week. It was a pleasant surprise when they called. I have never got a call from any other company to update me on the status of an order. Well I ended up with a great holster and great customer service. Thank you JM4 Tactical. AS ADVERTISED.....WHICH IS RARE THESE DAYS! It looks simple and straight forward but how many times do we get what we ordered and it's the complete opposite? The JM4 fit as advertised and worked as advertised. Besides the quick and easy slipping it on/off, I can finally have my pistol ready in the truck without figuring out where to put it that it won't get damaged and it's easily accessible. This holster opens up and I just slip it in my little open compartment by my leg on the center console....perfect and easy. Saved the $10 by getting the Original and with a little leather honey, she darkened up perfect. Definitely recommend. I must admit I was a bit skeptical at first but pardon the pun I pulled the trigger and order the holster. When I received it took a good look at it I thought it’s definitely high-quality the leather was beautiful and after working for about 10 minutes to break it in I fell completely in love It is now my EDC holster. So much so that I ordered another one yesterday for another fire arm Excellent product!! !